Global Green USA, Mountaire Farms, and Interstate Container announced completion of the conversion of the largest poultry plant in the US to recyclable, wax-alternative boxes, thereby reducing costs and environmental impact, and assisting its customers in cost-effectively meeting their environmental goals. At the International Poultry Expo, Global Green USA applauded Mountaire Farms and Interstate Container for their pioneering roles in reducing the environmental impact of wholesale transfer packaging as this innovation has the potential to influence the design of transfer packaging for all types of poultry, meat, produce and seafood delivered to grocers and restaurants throughout the world. Global Green also called on the food packaging industry to convert to this newly achievable green standard. 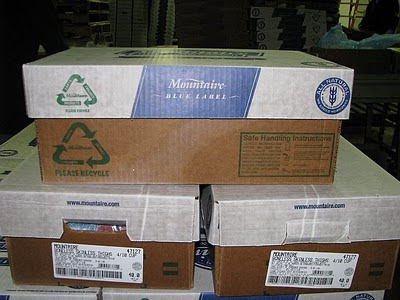 In March 2009, Interstate and Mountaire Farms announced its plans to conduct trials of recyclable modified atmosphere packaging through Hunt’s Point, the world’s largest food distribution center, as part of Global Green’s Coalition for Resource Recovery’s initiative to achieve 100% recyclable wholesale transfer packaging through the facility. 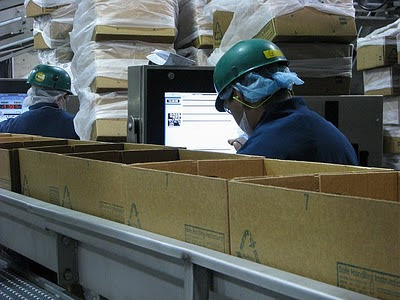 Trials began pallet by pallet through Hunt’s Point’s harsh conditions and progressed to the truck load, and finally a two week test where Mountaire product shipped solely in the Fibre Box Association (FBA)-certified recyclable boxes. The switch to FBA-certified recyclable packaging is only one component of the sustainable packaging transition. The switch in packaging methods from ice packed poultry to modified atmosphere packaging will result in significant water and energy savings. The box size was reduced, all wax was eliminated from the box, reducing the use of corrugated and petroleum products. If all of the newly designed boxes were recycled, the greenhouse gas benefit from source reduction and recycling the boxes would be 100,000 metric tons of carbon dioxide emissions annually. In addition, the switch from ice-packed poultry to modified atmosphere packaging is estimated to save millions of gallons of water annually. Combined these innovations also improve efficiency, streamline operations, and provide a safer work environment. It is estimated that 1.5 million tons of un-recyclable wax-coated corrugated boxes are discarded in the U.S. each year. If coated corrugated boxes were designed for recycling and recycled, a greenhouse gas savings of 5 million mtCO2e, equivalent to removing from one million passenger vehicles from the road, would be realized, and U.S. grocers and restaurateurs could save $63M annually in avoided disposal fees." To be competitive in today's world economy, our goal must be the sustainable use of materials," said Matt Hale, director of the U.S. Environmental Protection Agency's Office of Resource Conservation and Recovery. "Producing materials that can be recovered and reused at end of life helps us achieve this goal." According to Annie White, Director of Global Green USA’s Coalition for Resource Recovery, “Converting to transfer packaging certified as recyclable by the Fibre Box Association, is a readily achievable step that industry and businesses can take to improve their environmental performance, enhance their service to customers, and improve their bottom line. Global Green USA’s Coalition for Resource Recovery is an industry working dedicated to generating business value through transforming waste into assets. Founded in 1993 by activist and philanthropist Diane Meyer Simon, Global Green is the American Arm of Green Cross International (GCI), created by President Mikhail S. Gorbachev to foster a global value shift toward a sustainable and secure future by reconnecting humanity with the environment. Interstate Container Cambridge of Maryland is a member of Interstate Resources, Inc., member of INDEVCO Group. Greenhouse gas savings calculated using EPA’s WARM tool. Saving assumes 100% of the boxes generated are recycled. According to the U.S. EPA 2007 MSW Facts and Figures, 31 million tons of OCC is discarded each year. The Fibre Box Association estimates that 5% of OCC is wax coated. EPA WARM Tool and Greenhouse Gas Equivalencies Calculator were used to calculate potential greenhouse gas savings. National restaurateur and grocers savings are based on a national average tipping fee of $42.08 based on the 2006 data in BioCycle’s State of Garbage report.